The last workout that I have had the pleasure of joining in on was this yoga class at CrossFit Tidal Wave. At first I wasn’t sure if this was going to go over well, because it’s yoga, inside a box! We don’t normally think of CrossFit and Yoga together. Those are two completely different environments. In a CrossFit gym you get your tough on, blaring music, mind is set and focused, you go as fast and hard as you can. In a Yoga studio you get centered, relaxed, soft music, clearing your mind and holding positions and stretching. Surprisingly it worked out just fine. We all had our mats and soft music was playing and we had a great instructor. Everyone there was on board and that makes a lot of difference. The class was full and I hope that they will bring it back again. You’ve never seen so many tight people! To stay flexible and stretched takes twice as much work when you CrossFit. It can be done but you really have to make it a priority before and after class. I haven’t seen the inside of a gym in two weeks. I feel like I’m losing my sanity. That’s what can happen when there is no relief from stress. This past week the Mamavation Moms helped me get through a really scary time with my son. He was incredibly sick with a stomach virus that spread to the rest of the children one by one. My husband was away on business which left me cleaning up very unpleasant things and not sleeping. When you mix no sleep with a LOT of junk food you get the result of feeling just awful. My Mom was on hand to help me out, thank goodness! I’m not sure if I have had my hands quit so full. Luckily they are all on the mend so maybe I can carve out some me time again. I’m terribly frustrated with my results so far this year but that’s where inconsistency will get you. It’s unfortunate but true and I’m just steadily moving in a direction I don’t want to go in but this too shall pass. Workouts – I haven’t seen the inside of a gym for two weeks. I haven’t seen a track either. I’ve been stuck. Scale Reading– 163 Not surprised at all. This past week I have had zero sleep and I haven’t eaten a fruit or veggie to save my life. Stress Level – Pain seems to be gone. The stress level was incredibly high this past week with all three kids sick. The UP side– Still trying to get on board with this program lose 12 inches with 12 work outs. My interview on Workout Mommy.com was published today. Have I always been fit? Find out. My favorite fitness gadget? FITBIT! It’s an affiliate link so if you buy one I might get some change for the recommendation! You’re just steps away from better fitness. 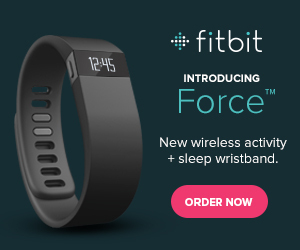 Try Fitbit now.